Have you ever wanted to design a videogame without having to learn all that pesky computer science? Well, the folks at Robomodo have your back. 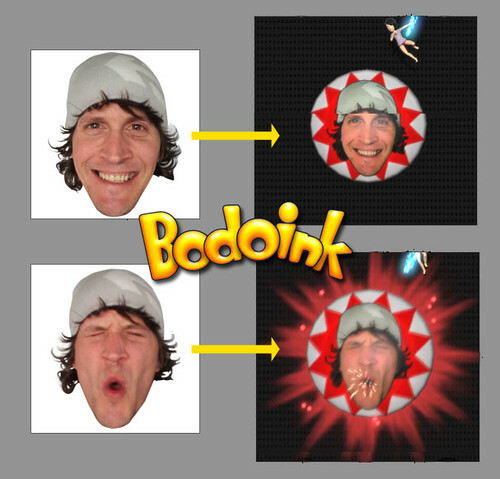 The studio behind the recently announced Tony Hawk Pro Skater HD has launched a Kickstarter campaign to help get funding for their latest game, Bodoink, a wacky pinball/pachinko hybrid for Kinect. By raising the money without having to rely on a publisher they’ll be able to retain creative control of the game, and they’ve decided to pass much of this control on to the project’s backers (namely, you guys). We spent some time this week with Robomodo lead designer Patrick Dwyer to talk about Bodoink and the Kickstarter (listen to the interview here), and to give the game a try. The first thing that comes to mind when the loading screen at the beginning of the levels pops up is the game Peggle, and in some ways this comparison works. In fact, Bodoink plays a lot like an insanely cracked-out version of Peggle in which your avatar is the ball and you have more control over where it’s going. You start out on a platform at the top of the level. Once you raise your hands above your head, you start falling, and the insanity begins. 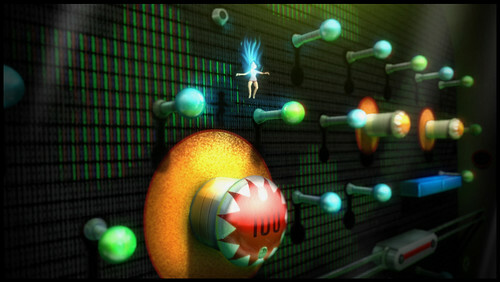 The typical Bodoink level is a colorful sea of pegs, platforms, and all manner of other bouncy creations. Your main objective is to get a ton of points by stringing together combos, which increase as you hit pegs of the same color. To navigate the levels, you’ll have about eight moves at your disposal, including gliding from side to side with your arms outstretched like a plane, rocketing to the left or right by swinging your arms in that direction, and launching yourself upwards by jumping into the air in a Superman pose. As you can imagine, this can get out of control quickly, especially when you start adding in elements like moving pegs and springboards that blast you across the level. Trying to get around the levels and maki ng a fool of yourself in front of the Kinect is fun, but there is some actual strategy involved. Bodoink is all about combos, and to get the highest combo you’ll have to get skilled enough to dodge pegs that aren’t the color you’re looking for. The other trick of the game is staying alive. Just like in pinball, you can only hit the bottom a few times before you’re out, so you’ll have to figure out ways to get back up to the top of the level. The most important thing to mention isn’t so much about the game as it is about the creators. Talking to Patrick, it’s clear that he has a great sense of humor and a deep love of videogames and popular internet culture. Some of the avatar victory dance options they’re thinking about including are downright hilarious (and you can vote on them!). One of the levels was designed as a tribute to the bonus levels of the original Sonic the Hedgehog, and has you bouncing around collecting as many coins as you can in a certain period of time. It’s clear that the team wants to throw in some additions that gamers will appreciate, and from what they have so far it seems as though they’re on the right track. You’re probably thinking “Wow, it sounds like Bodoink could hit the market tomorrow!” In reality, everything we’ve talked about is really just the shell of what looks to be a pretty fun game. The engine’s been designed, gameplay is fairly far along, and the ideas that make it fun to play are in place. So what’s left? That’s for the Kickstarter donators to decide. If Robomodo can raise enough money in the next 12 days, the community will be able to vote on just about every aspect of the game. You’ll be able to vote on topics like which dances will go into the game, what sort of backgrounds the levels should have, and other design-oriented things. And that’s just for the $20 backers (which also includes a copy of the game). Some of the more expensive rewards get really crazy, including getting your picture in the game, getting your name in the credits, coming up with an achievement and making up a name for it, or even a steak dinner from the president of the company. Why else should you think about donating? If this Kickstarter campaign succeeds, who’s to say that this won’t just be the first of many? Being able to self-publish games allows studios to maintain greater creative control over their work, and to not have to compromise their vision. We could see more interesting games crop up on XBLA, where before they may have been stuck in the Indie Games section. Plus, think of all the awesome swag you can get from development studios that you support. In conclusion, if you’ve ever wanted to help design a game but just haven’t gotten around to it for whatever reason (time, technical know-how, game would be too good and put all other developers out of business, etc), Bodoink seems to be a worthy way to do it. Even at this stage in development it’s quite a bit of fun to play. Don’t worry though, if the Kickstarter campaign doesn’t succeed the folks at Robomodo say that this game will still be coming to XBLA at some point in the future. Check out our special podcast here for some more chatter with Patrick about Bodoink and Kickstarter, and stay tuned for more information about this fun and interesting title as it comes along.